Secret location tracking Uber Can Now Track Your Location At All Times Uber Can Now Track Your Location At All Times Uber now has the capacity to track riders even after they have completed their journey. Which should worry anyone who cares about their privacy and security. Read More , toxic company cultures, congestion problems, arguments with city mayors, and a near-endless list of business malpractices. Ridesharing apps haven’t exactly covered themselves in glory in recent years. But that’s not stopped people from using the services that the companies provide. Uber has now completed more than five billion trips and is clocking up a barely-believable 5.5 million trips per day. However, Uber is no longer the only show in town. The company’s business model has been replicated around the world. As a result, Uber’s market share in the United States declined by more than 10 percent in 2017. Today, it’s the most significant competitor in North America is Lyft. But which service should you use: Uber or Lyft? In this article, we’re going to put the two apps head-to-head and compare five criteria. A ridesharing service isn’t very useful if it’s not available when you need it, so let’s look at how Uber and Lyft compare in terms of availability. Uber operates in 633 cities worldwide. That number covers a vast number of American cities, and more globally-renowned locations in Europe, Latin America, Africa, Asia, and Oceania. In contrast, Lyft has traditionally only been available in the United States. It expanded into Canada in December 2017, but that’s the only other country it operates in. Even in the domestic American market where Lyft specializes, Uber comfortably wins. It counts more than 250 markets whereas Lyft barely operates in 100. Sure, Uber started life as a glorified taxi service, but today the company has expanded its operations considerably. Although not all the services are available in every city, Uber offers 17 standalone products. They range from the well-known offerings such as UberEATS The Best Food Delivery Service: UberEats vs. Doordash The Best Food Delivery Service: UberEats vs. Doordash We compared the speed and quality of two of the biggest food delivery services in the market right now: DoorDash and UberEats. Read More through to the obscure. For example, have you ever heard of UberAUTO (a rickshaw service in Pakistan), UberBOAT (a water taxi service in Istanbul), or UberAIR (an aircraft service launching in 2020)? Lyft’s services are far more limited. Yes, the company has been experimenting with self-driving cars, and it offers services like ridesharing and six-person vehicles, but it lacks the diversification of Uber. At one time, Lyft was developing a rival to UberEATS, but the plan met with resistance inside the company and was abandoned. Many people don’t care about riding in a top-of-the-range luxury vehicle or whether a driver offers you a bottle of water. They just want to get from A to B for as little money as possible. Sadly, it’s not easy to make a like-for-like price comparison between Uber and Lyft Find Out How Far Uber or Lyft Can Go on Your Budget Find Out How Far Uber or Lyft Can Go on Your Budget If you want to go somewhere but only have so much cash in your pocket, this tool can tell you how far services like Uber and Lyft will take you. Read More . Factors like surge pricing, time of day, and even the city you’re in all have an impact on how much you will pay and make it difficult to tell if Uber or Lyft is chepaer. Things quickly become confusing. However, there are some broad similarities. When using either company, you can expect to pay about $1 on average to start a ride, an average of $1.50 per mile, and an average of 25 cents per minute. All combined, you can expect to pay about $2 per mile with each company. We’ll give the point to Lyft, merely due to its cheaper surge pricing system. Lyft will often go to x2, whereas x8 is not uncommon on Uber. If you’ve used Uber and Lyft, you will know the two apps function in a similar way. You tell the app where you want to go, and you’ll see nearby cars and a price estimate. Both apps also allow you to tip your driver You Can Now Tip Your Uber Driver... Finally! You Can Now Tip Your Uber Driver... Finally! Uber is finally allowing riders to tip their drivers. This change in policy won't please everyone who uses Uber, but most people realize it's long overdue. Read More and add multiple stops to your journey How to Request Multiple Destinations in Lyft How to Request Multiple Destinations in Lyft When ordering a Lyft, you can actually let your ride know ahead of time that you're going to need to go to two locations. Read More . 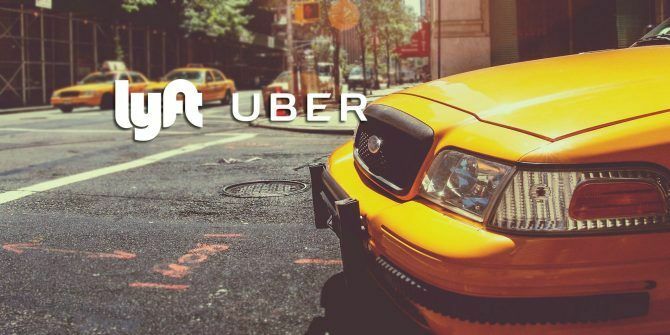 However, as Uber has grown its ancillary services like UberEATS, the main Uber app has become one of the company’s primary advertising tools. What used to be a slick and professional app has become increasingly bloated and hard to navigate. Lyft used to trail Uber in the professionalism stakes; it appealed to a “hippy” crowd. But after retiring its famous mustaches a couple of years ago, it’s grown up and become more serious. Again, we’re going to give the point to Lyft. Today, the company’s app feels like the Uber app did three years ago when it was in its pomp. Critics have accused both Uber and Lyft of destroying the traditional taxi industry What Is Uber and Why Is It Threatening Traditional Taxi Services? What Is Uber and Why Is It Threatening Traditional Taxi Services? Uber has landed, and it's fundamentally changing inner-city transit. And some might say, not entirely for the better. Read More with their ruthless approach. Typically, the companies’ modus operandi sees them enter a new market without the necessary permits, then use lobbyists to create a political storm if the authorities don’t grant a business license. Throughout 2014: The company used an internal tool called Greyball to avoid giving rides to law enforcement officers in areas where its service is illegal. In May 2017, the United States Department of Justice opened a criminal investigation into the issue. February 2016: Uber driver Jason Dalton shot six people in Michigan while working. He continued driving and accepting fares while the police undertook a seven-hour manhunt. February 2016: A former Uber employer who reported sexual harassment to her superiors was threatened with the sack if she didn’t drop her claim. Mid-2016: Uber suffered a data breach. 600,000 drivers and 57 million customers were affected. Instead of reporting the loss, Uber paid a $100,000 ransom to the hackers. January 2017: Uber was forced to pay $20 million to the US government after lying to drivers about potential earnings. November 2017: Paradise Papers revealed Uber used offshore accounts to minimize taxes. The points we’ve listed above don’t even scratch the surface of Uber’s issues. Of course, Lyft isn’t perfect, but it prides itself on being a lot less controversial than Uber. Uber vs. Lyft: Which Should You Use? As you will see from our running score, we’ve given the victory to Lyft. But in truth, Lyft only gets the nod because of Uber’s poisonous corporate image. From a rider’s standpoint, no one stands out very much in the Uber vs. Lyft battle . Certainly, the difference is much less noticeable than it was a few years ago. Some users won’t care about Uber’s corporate indiscretions. If you do, you should choose Lyft every time. But if you don’t, you’ll need to decide what’s more important to you: availability and services or cost and ease-of-use. Explore more about: Lyft, Uber.